Once signed, we intend to send it to a radical Italian paper, Il Manifesto, and to the websites of the No TAV Movement. Please, if you help collecting signatures, make sure they all are sent back to me. We are aiming to send a first two hundred -at least- by Friday. Thanks! Silvia Federici. For twenty years in mountains of North West Italy, not far from Torino, a powerful movement has grown that has resisted the Italian government’s plan to build a high velocity railroad, which in addition to being very costly and economically useless would certainly destroy the mountain environment. 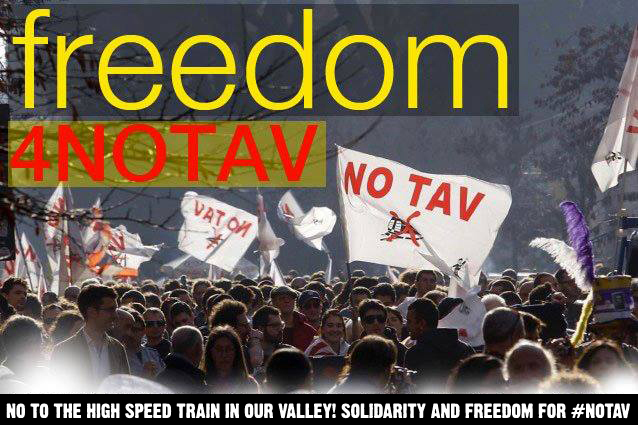 Over and over, the NO TAV movement, now well-known throughout Europe, has come under attack by the police and the army, besides being the object of a smear campaign by politicians of almost every political stripe. However, so strong has been the determination of the people of Val di Susa and their many supporters to resist this assault on their land and their lives that so far no real construction has taken place and all that the companies in charge of the project have achieved has been to surround thousands of acres of land, belonging to the local population, with barbed wires and cops. It is now generally recognized, even at the EU level, that the construction of the high velocity railroad is unnecessary, so that some participant countries have already withdrawn from the project. Nevertheless, the Italian government has even further intensified its attack on the resistance to the TAV trains, with the full militarization of Val di Susa. As the villagers of this beautiful historic valley, near the border with France, the center of the partisan resistance to Fascism and Nazism in the ‘40s, have repeatedly denounced, no effort has been spared to repress ideologically and physically the legitimate protest of the residents of the valley who would bear every day the consequences of the TAVS. Already the land of Val di Susa has been drenched with tear gas, and many have been arrested, wounded, and some have even died because of the government’s outrageous determination to complete this work regardless of its devastating consequences for the people of the valley. Now a new violent assault on the No Tav movement is unfolding that demands a clear response by all those in and out of Italy who believe that the systematic destruction of our environment and the violation of people’s most basic needs and demands are crimes that affect us all and we should not tolerate. On Monday morning, July 29, the DIGOS – the political branch of the police – has raided dozens of homes in Torino and in Val di Susa. Twelve comrades have been forced to open their houses to its agents, who have then proceeded to search for incriminating materials, presumably related to their protest against the enclosure of the land of the valley with hedges of barbed wire. Instructed to look for explosives and cutters, the police have failed in this goal, but they have confiscated all the audio-visual and telecommunication materials they could find, clearly the real objective of the search. As one of the activists raided put it: “They came for weapons, they left with computers and phones”. Anyone who has been in Val di Susa, or has followed the long history of the protest its people have mounted against the TAV knows this charge is false, outrageous, and is a classic example of blaming the victims. Not surprisingly the “proofs” are manufactured. At one of the houses raided, a map of the valley was found with marker-signs on it. The young woman living there is a member of the Legal Team for the movement, and the map is part of the material that she was to submit to the defense in trials that are already taking place against some of its members. On it, the sites are marked where in 2011 several people were brutalized by the police. But according to the investigators, the map proves the existence of a militarily organized guerrilla movement. We do not think this operation will succeed. The people of Val di Susa have fought the fascists, have fought the Nazis, and for twenty years they have been able to push back the attempt of the Italian government to destroy their mountains, already traversed by many railroad lines and a recently constructed highway. However we should not underestimate the will of the government to crush this movement. This in fact appears to be the primary objective of the present operation, as reports indicate that, even from a capitalist viewpoint, the TAV project is turning out to be economically unfeasible. Why to pursue it then with so much obstinacy, to the point of stomping over the lives of thousands of people? Is it because the Italian government cannot admit that when people struggle in a unified way they can win? Or is it that the profits that private companies would make would outweigh the failure of the project to bring any benefit to the country as a whole and outweigh as well the immense agony and loss inflicted on the people of Val di Susa? Politics these days has a surreal character. Lies, distortions, arguments motivated solely by the narrowest of private economic motives are the order of the day. But the fictitious character of the charges brought against the victims of the raid should not deceive us about the damage they can inflict. At the very least these attacks are forcing a movement to re-channel its energies from the struggle against the TAV to the defense of those under attack. This is why we need to support the NO TAV activists under investigation, we need expand our support for the NO TAV struggle, and send a clear message of protest to the Italian government, demanding it ends the persecution of the No TAV activists and put an end to the TAV project itself. *Listen to the legitimate protest of the people of Val de Susa and abandon the TAV project itself, which has already caused so much suffering to so many people. Silvia Federici, Emerita, Hofstra University, Hempstead, New York. Posted on August 9, 2013, in Europe and tagged Italy, No TAV. Bookmark the permalink. Leave a comment.